The ultimate Santorini escape, located at the southern end of the island in the area of Akrotiri offering its guests fabulous views from each of the hotels 40 suites and villas. Ambassador hotel suites offer luxury accommodations with private pools and Spa, each suite is individually designed in modern Cycladic style. The hotels features include a fine dining restaurant, pool bar with snacks, infinity swimming pool with spacious terrace, sun loungers and sun shades. Luxurious Spa & Wellness center offering holistic treatments, soothing massage sessions and therapies while using only the finest ingredients of nature. The Ambassador hotel and luxury suites is an amazing place for weddings and special occasions, the terrace can accommodate 100 guests. The luxurious infinity swimming pool is the perfect location for Wedding photos and the restaurant can offer a selection of menu options. 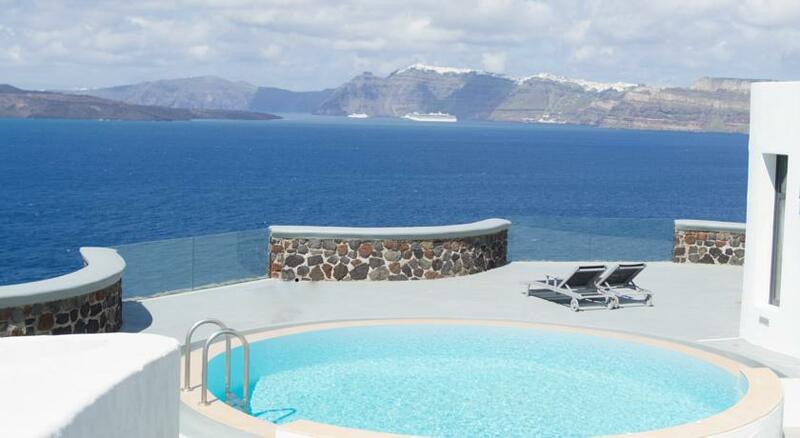 The hotel has a dedicated team who will make all the arrangements for that special day, Santorini has many beautiful locations but the Ambassador hotel is hard to beat.